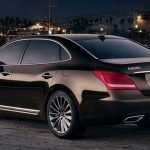 The Hyundai Equus is a large luxury sedan that is based on Hyundai’s previous-generation Genesis platform, but it’s been enlarged to provide limousine-like interior room. Under the hood is a 5.0-liter V8 generating 429 horsepower and 376 pound-feet of torque. 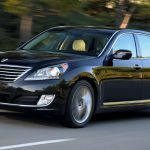 Power is sent to the rear wheels through an eight-speed automatic transmission. 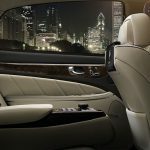 Inside the Hyundai Equus, the highly adjustable front seats are a pleasure to settle into no matter what the weather, as the built-in ventilation system circulates heated or cooled air through the perforated leather upholstery. 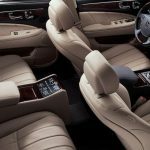 Rear seat passengers will enjoy the vast amount of legroom, especially since the outboard seats recline. These, too, are heated and (in Ultimate trim) cooled, and the central armrest folds down to reveal a bevy of controls for seat lumbar, rear power shade and rear seat entertainment displays (if equipped). 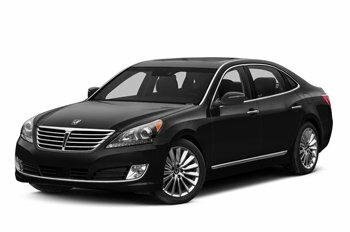 On the highway, the Hyundai Equus drives like a large luxury sedan should. It’s exceptionally quiet at speed, and the ride is soft and comfortable.